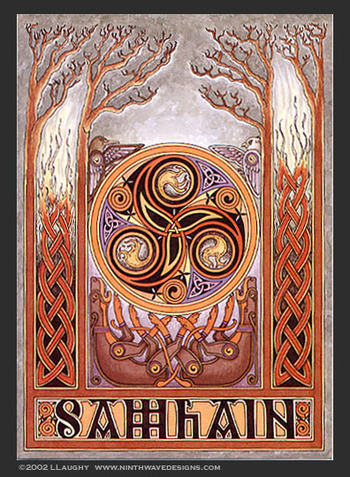 Samhain (SAH-wen) represents the end of the harvest when the ‘summer goes to rest’. It is a cross-quarter festival, celebrated approximately halfway between the autumn equinox (Mabon) and the winter solstice (Yule). It is a time to honor our ancestors and embrace the darker half of the year. Known as Samhuinn/Samhainn in Scottish Gaelic or Sauin in Manx Gaelic, Samhain is thought to be the Celtic predecessor of Halloween. The Christian festivals of Old Hallowmas/All Hallows Eve, All Saints Day and All Souls Day also focus on remembering departed ancestors. Samhain is the last of the three harvest festivals, the others being Lughnasadh and Mabon. In many Neopagan traditions, Beltane and Samhain are treated as the most important dates on the Wheel of the Year. They divide the year into its two primary seasons, the dark season of winter, and the light season of summer. 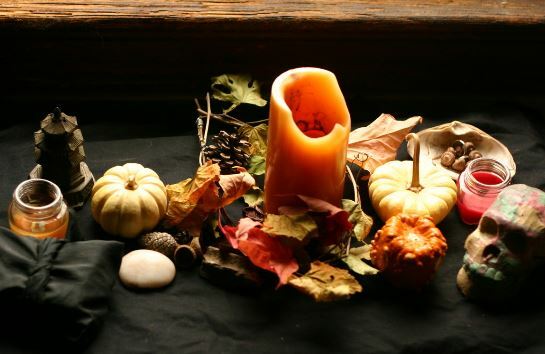 Traditionally, Samhain marks the end of summer and the beginning of the dark days of winter. Samhain is also called the ‘Blood Harvest’, given that traditionally, this is the time when livestock were culled to provide food for the upcoming winter months. 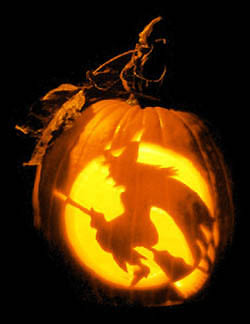 Samhain is considered the most important of the eight Wiccan Sabbats and is sometimes known as the ‘Witch’s New Year’. In most Wiccan traditions, Samhain marks the time when the God dies to ensure our continuing existence, represented by the decline of the earth’s abundance. He will be born again at Yule, with the ‘birth of the sun’. Samhain is a time to honour our ancestors, celebrate the memories of those who have passed, and embrace the darker half of the year. It is a common time to study the ‘Dark Mysteries’ and reflect on the endless cycle of life and death. Common ways to honour departed ancestors and loved ones were to leave food offerings on altars or doorsteps for the ‘wandering dead’, as well as to place lit candles in windows to help guide spirits home. Traditionally, gourds (like pumpkins and turnips) were carved and candles placed inside to be set in windows and doorways, likely the origin of the modern-day ‘Jack-o’-Lantern’. Other ways to remember ancestors was to have a ‘dumb supper’, where an extra place was set at the table for departed loved ones and no words were spoken during the meal. It is thought that the veil between the worlds is thin at this time (along with Beltane), allowing easier communication with spirits and loved ones who have passed on to the ‘other side’. 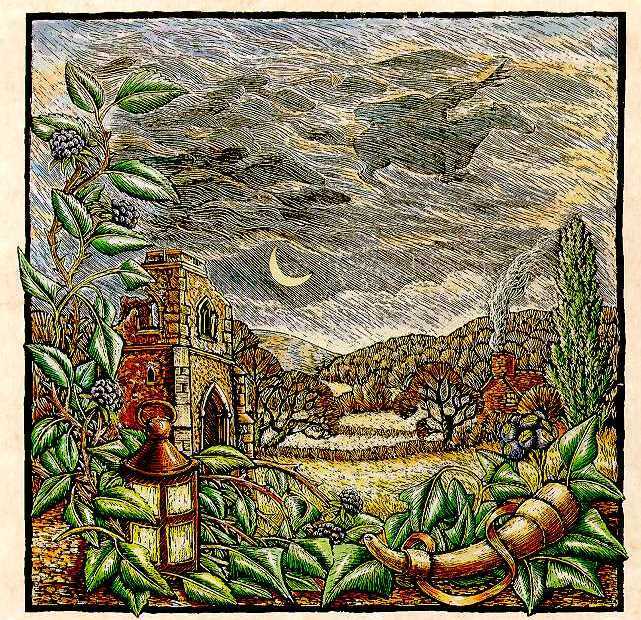 Similar to Beltane, it is thought that Faery folk are very active at this time, pulling pranks after dark. Given that some spirits were not welcome, people would try to hide their identities by wearing masks and costumes. 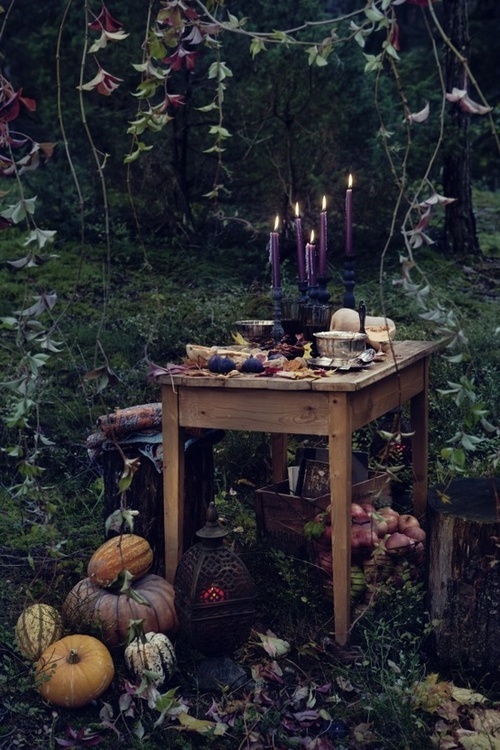 Samhain is associated with carved gourds, food offerings, balefires and candles, masks, brooms, and the waning moon. It’s a time to focus on change, reflection, endings and beginnings, and honouring the dead. It is also thought that divination is particularly powerful at this time of year.